Mieczyslaw Weinberg’s opera The Passenger is mainly based in Auschwitz, but the themes are far far more complex than that. The opera is sited on two time/space levels–the deck of a 1955 passenger ship where a woman believes believes another passenger had been sentence to death in Auschwitz under her command; and the “hold” of the two-tiered set, where the women prisoners of Auschwitz in 1943, are living and dying, and where one male prisoner takes his musical revenge. But the themes are different, encompassing guilt, paranoia, illusion, memory, and the universality of the concentration camp. For this opera, while composed by a Polish-Russian Jewish composer was written by a Catholic woman who emphasized what writers like Elie Weisel had only recently come to terms with. That not only Jews but all “inferior” peoples, the Russians, Gypsies, Poles, etc etc etc were victims for the “final solution”. But now we come to this opera, written in 1968 and not performed for more than 40 years. 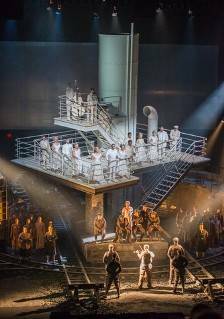 The first American production was in Houston, and the Houston Grand Opera presented this mammoth work in New York for the first time last night. On a visual level, the effect was stunning in every way. It takes a setting like the 55,000-foot armory to house the two-tiered set, the audience, the orchestra, the complex lighting effects. From the shimmering-white passenger deck–the ship turret, the dress, the clean white lighting–to the musty turd-brown colors, the women in dingy dress, hair chopped down, the officers in the same turd-brown uniforms–one goes from an illusional heaven to a metaphorical hell. The tracks where the scenes are change here are not production tools. They are the same kind of tracks on which the baggage cars of prisoners were brought to prison camps all through Europe, adding to the horror of the situation. Directorially, David Pountney (who also translated from Russian and German) never let a single moment grow slack. From the moment that the ex-SS guard sees–apparently–the prisoner under her command/threat/affection/hatred–to the agony of her husband–to her private quarters, to the terror of the camp on the bottom tier of the set, Mr. Pountney had given his large cast so much to do that one couldn’t possibly depart from watching it. Here was a bizarre dance scene on the ship, a macabre birthday celebration in the camp, several prisoner beaten and taken to be killed, a few prayers (which aren’t as maudlin as one might expect), and a climactic scene in the prison camp where a Bach Chaconne played unexpectedly by a Polish prisoner, is turned into a massacre. I hate to use the word dazzling, for the Auschwitz scenes are dingy, dark, clouds of dust wiping out whatever dazzlement the effects might have. But the visual effects are mesmeric. With this direction comes some fascinating acting. Michelle Breedt and Joseph Kaiser are the husband and wife. Ms. Breedt’s character is near crazed, but the agony is hidden. Mr. Kaiser is more than a prop. He is the selfish diplomat not upset that his wife was with the SS but that it might ruin his career. Marta–the woman in a veil who could have been the prisoner–is mysterious on deck, but in the camp, is a Madonna (so she is labeled by the others), but soprano Melody Moore is consoling, sympathetic, an enigma whose own thoughts come out only at the quite chilling climax. But this is an ensemble opera. One or two religious supplications, a Russian folk song, the last monologue by Ms. Moore stand out, only because the opera is a mighty effort of the whole assemblage. Onto the most important part, the music. The only reason Mieczyslaw Weinberg is not played frequently here is his similarity to Dmitri Shostakovich. (I remember hearing his gorgeous Moldavian Rhapsody a few years ago, thinking, “Who is this composer?” After many a YouTube download, his greatness is obvious. And the first act has so many dramatic points to make that the music–conducted with fervent accuracy by Houston Grand Opera leader Patrick Summers–that Weinberg has composed a series of blatant, clever punctuation points. I don’t know if he wrote other operas, but he obviously knew that the exposition didn’t need more music than necessary. The second act music shows that Weinberg has made one of the iconic operas of the 20th Century. 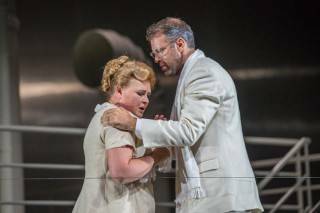 It’s questionable whether The Passenger is up to Lulu or Wozzeck, but it tops what now seems artifice in late Puccini, and is more dramatically effective than Henze. Yet in this second act, Weinberg has the syncretic sense of sarcasm which Shostakovich admired so much. The craziness of the “nice” dancing on the stylish deck, the distorted “favorite waltz” of the SS Commander, the songs of a birthday celebration, the quasi-modal chords for the prayer, show Weinberg’s mastery of each style. Not only mastery but knowing instinctively what is necessary for the greatest impact. The finale, a monologue by Marta, with the SS officer in a fetal position behind her, is musically, operatically so effective that I feel horrible saying something critical. Yet, to repeat, this opera is about illusion and the frightening part of memory as much as a concentration camp. And oh, I wish that we could never be assured that this “ghost” was the real Marta or not. And the final scene seems to give the game away. Yet perhaps I’m wrong. Perhaps this last aria, while sung by Marta, is actually imagined by Liese, the SS commander. Perhaps the whole thing is the illusion the bad dream of a woman bedeviled by nightmares. Perhaps...perhaps. And it says so much about The Passenger that we are as wrapped up in the opera that we care to make these choices. The Houston Grand Opera Orchestra and Chorus did give a reality to the word “grand”. And Mieczyslaw Weinberg, whose 20-odd symphonies are surprising and whose Cello Concerto is the finest of the last century, deserves nothing less than grandeur for a benumbing story and a breathtaking production.